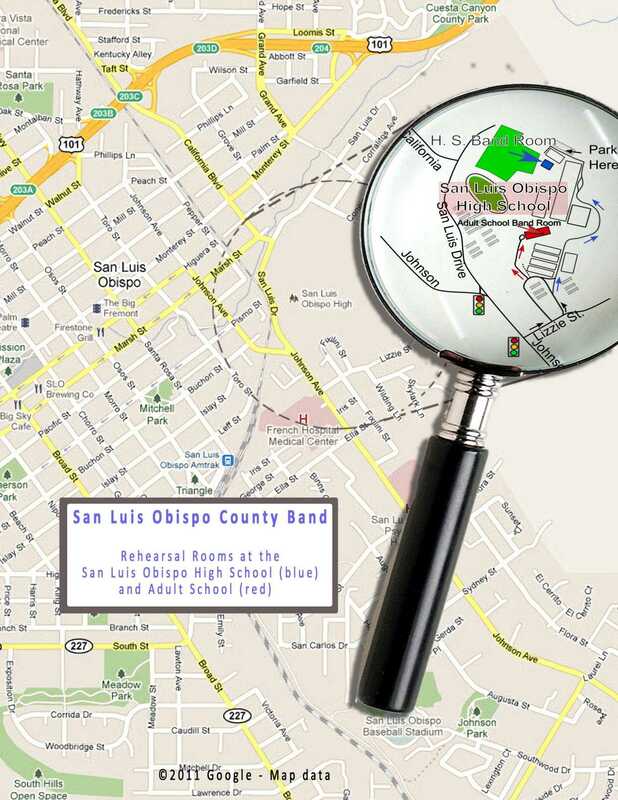 The SLO County Band practices every Thursday evening, from 7:00 to 9:00 pm in room J4 at the San Luis Adult School (the 'old' SLO Junior High), 1500 Lizzie Street. The Adult School is adjacent to San Luis Obispo High School. Turn on to Lizzie Street from Johnson Avenue (across the street from French Hospital), then take the second left turn to enter the Adult School campus. Click here to see a detail that shows the location of the rehearsal rooms. Anyone interested in the band is invited to join us at those rehearsals. You must bring your own instrument and a music stand, but the music is provided by the band.